Children, staff and families from Riverside Cottage Nursery in Blackburn, West Lothian have been fundraising for their long-term charity partner. 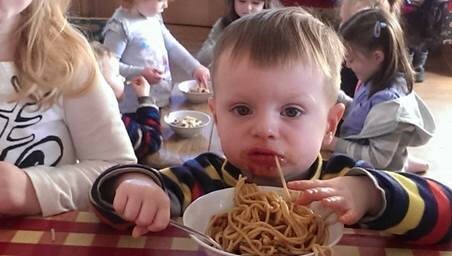 In January, Riverside hosted a pop-up veggie cafe, with recipes based on the nursery’s own vegetarian cookbook ‘Free Range Eats’. The event raised £100, which was added to another £150 raised through the sale of hand-made decorations and cards in the nursery’s Christmas shop. Added to £2500 raised recently, this brings the fundraising total for SANDS to £2750. Riverside’s Free Range Eats recipe book can be purchased here from the shop on the SANDS Lothians website for £5, with all proceeds to the charity.